In 1995, the Maryland Department of Natural Resources acquired 3,400 acres formerly known as the "Woodmont Rod and Gun Club." This private hunting club, adjacent to canal mile 135, was founded in 1870 by Grover Cleveland and Admiral Robely Evans, a distinguished admiral during the Civil War and Spanish-American War. Guests have included Presidents Garfield, Benjamin Harrison, Arthur, Hoover, Franklin Roosevelt, as well as Babe Ruth. The club was a stop on the famous "Douglas Hike" to protest plans to build a road along the Potomac in 1954. 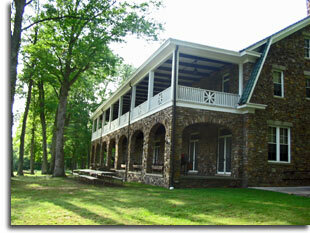 This private club had a stone clubhouse built in 1930 that overlooks the Potomac River. The Woodmont Natural Resource Area is accessible to the public in several areas for hiking, wildlife viewing, fishing, and hunting. In 1998, the Woodmont Chapter of the Izaak Walton League (IWLA) formed a partnership with the Maryland Department of Natural Resources to maintain and manage the lodge. Woodmont is accessible to the public in designated posted areas (2,000 acres) throughout the year to hike, observe wildlife and enjoy its spectacular scenery. The Woodmont Lodge is open every September to allow visitors to describe the history of the property. Hours are from 10 am to 3 pm. Photo: Maryland Department of Natural Resources.